Talk about having fun!!! Baby 411 is definitely a game that EVERYONE should be playing. We played it at my friend's baby shower and everyone had a BLAST!! It is a trivia game where all the questions are about labor and delivery and taking care of a newborn. The ladies hosting the baby shower got the game to play at the party but then gave it to the mother-to-be as a gift to take home and play with her husband, family and friends (that weren't at the shower). 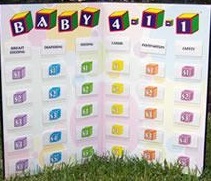 Baby 4-1-1 is the perfect baby shower game! With this game, your guests are guaranteed to have a lot of fun and everyone will be laughing. PLUS you will be educating the mother-to-be instead of sitting around scaring her with stories about how long you were in labor and how many times you had to push. Play Baby 411 at your next baby shower and host the party that everyone will be talking about! Perfect game for any size baby shower. 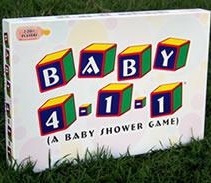 Play Baby 411 and bring everyone at your baby shower together with laughter. Players pick a category and a dollar amount (like Jeopardy). All categories and questions are about labor, delivery and taking care of a newborn. The question on the card in that pocket is read out loud to the other player(s). The first player to provide the correct answer is awarded the dollar amount on the card in Baby Bucks. The game is set-up to play only 6 categories at a time. With 12 categories to choose from you can play the game over and over and have different questions each time. The player with the most Baby Bucks at the end of the game is the winner! !